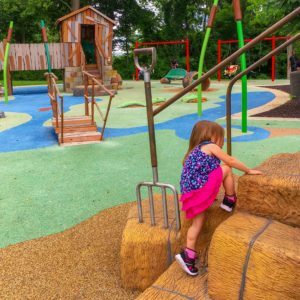 Walker Mill Regional Park in District Heights, Maryland is another imagination playground in Prince George’s County, the same County that boasts Watkins Regional Park in Upper Marlboro. Walker Mill Regional Park is a bit east of Washington, D.C. We visited on a Sunday afternoon, as we just happened to be in the area. We took a picnic lunch, and were happy to find that the park has nice picnic tables surrounding the playground. Upon arriving, we parked in the lower lot and walked up the hill to the park. From below, we could see a large slide and a cool entrance sign, but that was about it. We knew it was going to be a great park as soon as we heard the little garden gnome at the entrance, telling jokes! 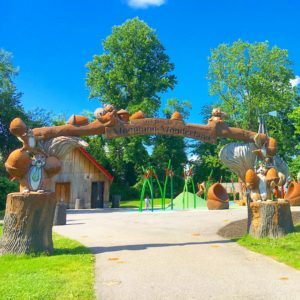 I had never seen a park with this feature before! We crossed under the entrance sign and saw the entire park; it’s very impressive. The first area of the park has water features, which is the “misting” area of the park. You can hit a button and have a regular slide turn into a “water slide” because the mist from the button-activated sprayer hits it. There’s also a fish that spits out water. Even though it seemed to be a fine mist, the kids were getting pretty soaked. Beside the water area is several slide and climbing structures that are all themed with trees, rocks, and other nature elements. 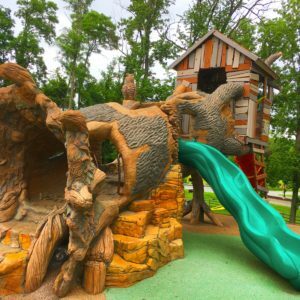 One slide structure has a large tree that kids can climb up through the inside of the tree. One slide is made out of a “fallen tree” next to a house that looks like a little shack. A very popular area of the is the windmill slides. 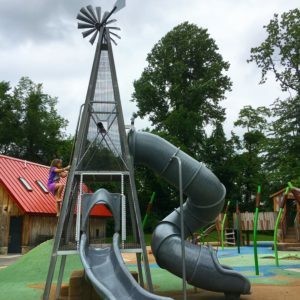 Kids can climb to the top of a windmill structure and choose whether to use the lower slide or the upper slide. It’s a fun, farm feature that I’ve also never seen in a park. The park also has a set of swings on the outskirts, and cute bridges and other cute themed elements. An essential part of all parks for kids is the bathrooms, and this park has a set of restrooms very close to the play area. It’s also nice to have a place to take cover from the rain, as it looked like it may rain when we visited. If it did start to rain, we know we could take cover and sit at the picnic tables until it passed. 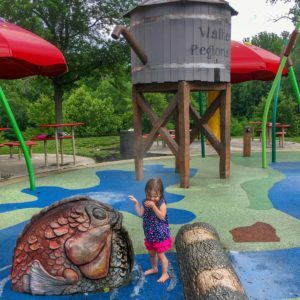 Overall, Walker Mill Regional Park was a hit with a 6-year-old and 2-year-old, and we hope to visit again soon!